In the late 1800s, male Chinese immigrants were brought to the U.S. to work on the railroads and as agricultural labor on the West Coast; many also specialized in laundry services. Some came willingly, others were basically kidnapped and brought forcibly. 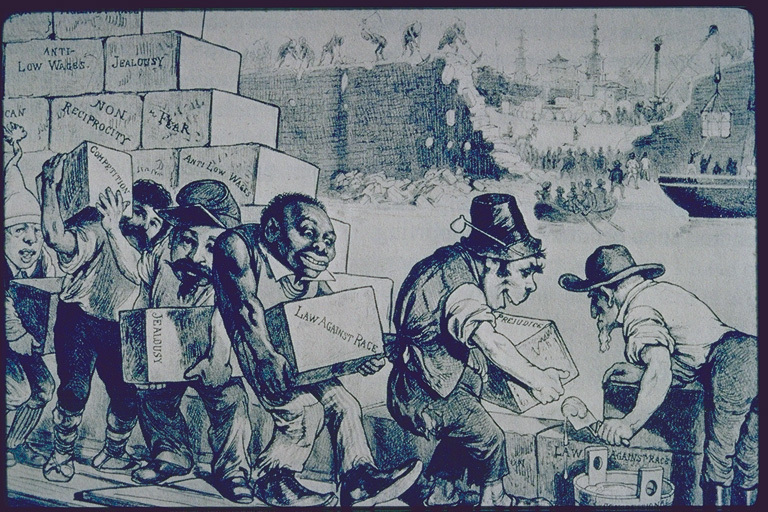 After the transcontinental railroad was completed, it occurred to white Americans that Chinese workers no longer had jobs. They worried that the Chinese might compete with them for work. 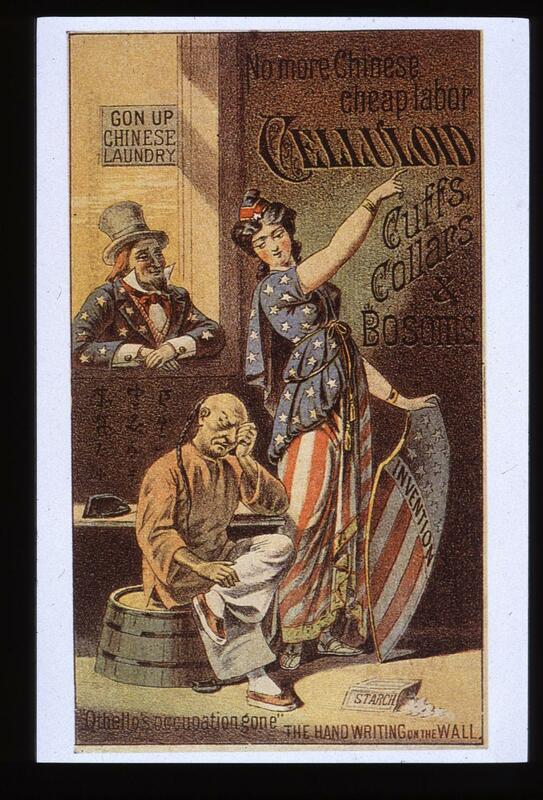 In response, a wave of anti-Chinese (and, eventually, anti-Japanese) sentiment swept the U.S.
Chinese men were stereotyped as degenerate heroin addicts whose presence encouraged prostitution, gambling, and other immoral activities. A number of cities on the West Coast experienced riots in which Whites attacked Asians and destroyed Chinese sections of town. Riots in Seattle in 1886 resulted in practically the entire Chinese population being rounded up and forcibly sent to San Francisco. Similar situations in other towns encouraged Chinese workers scattered throughout the West to relocate, leading to the growth of Chinatowns in a few larger cities on the West Coast. 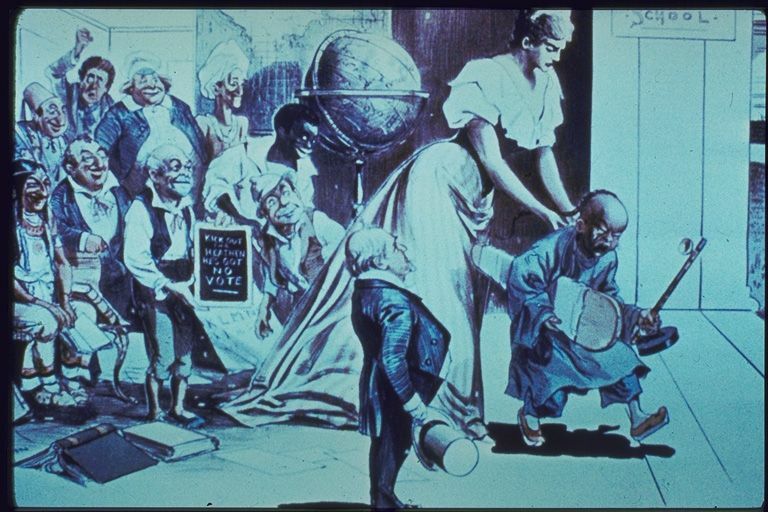 The anti-Asian movement led to the Chinese Exclusion Act of 1882 and the Gentlemen’s Agreement (with Japan) of 1907, both of which severely limited immigration from Asia. Support was bolstered with propaganda. 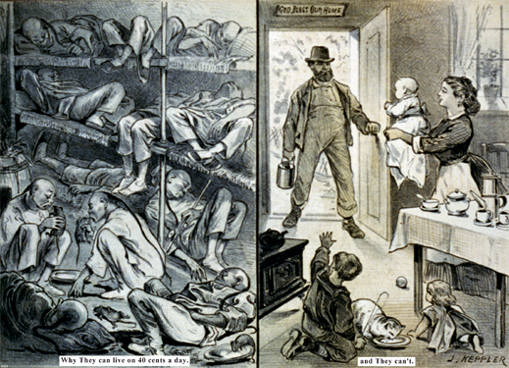 “Why they can live on 40 cents a day…and they can’t,” this poster says, referring to the fact that white men can’t possibly compete with Chinese workers because they need to support their moral families. The Chinese, of course, usually didn’t have families because there were almost no Chinese women in the U.S. and white women generally would not marry a Chinese man. 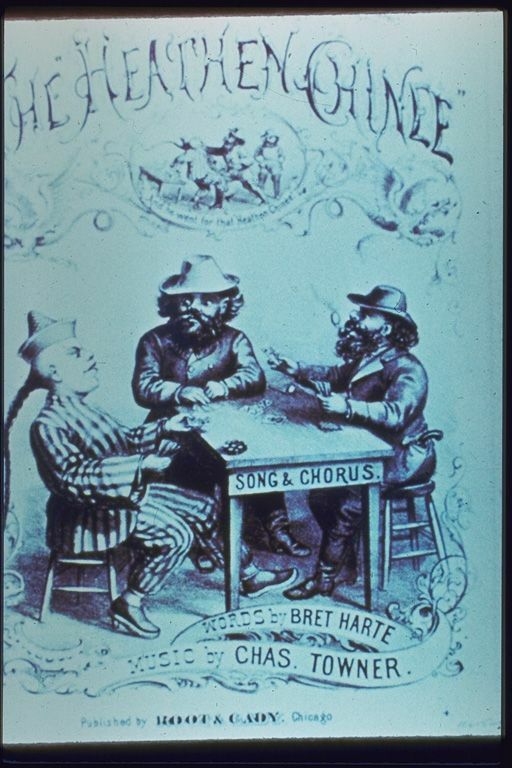 The following images were found at the The History Project at the University of California-Davis. During World War II, attitudes toward the Chinese shifted as they became the “good” Asians as opposed to the “bad” Japanese. However, it wasn’t until the drastic change in immigration policy that occurred in 1965, with the passage of the Immigration and Nationality Act, that Asia (and particularly China) re-became a major sending region for immigrants to the U.S.
"During World War II, attitudes toward the Chinese shifted as they became the “good” Asians as opposed to the “bad” Japanese." Milton Caniff was commissioned to do a quick guide for telling Chinese and Japanese people apart... not that the Chinese are in any way an homogeneous population! Closer inspection on the image for "The Heathen Chinese" actually shows it says "The Heathen Chinee". Charming. 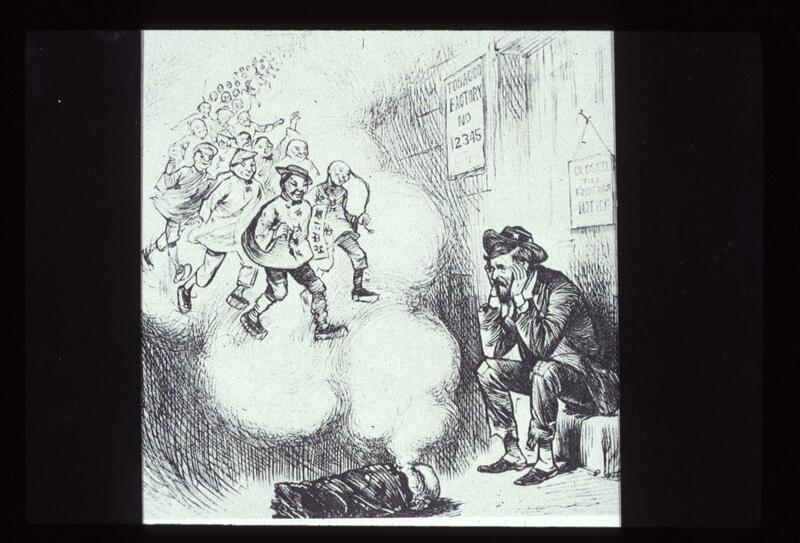 One of the finest caricatures of an Irish immigrant I have seen. And look! the little fella is carrying a block named 'prejudice'. Oh how times have changed. Today's social critics can have a field day exploring 19th century America. The Chinese labor issue almost pales in comparison to slavery and the resultant civil war and the "relocation" of large numbers of Indians west of the Mississippi. And of course women were of lower stature than men. They couldn't vote and in most places couldn't own real property. We are not perfect today but in a relatively short period of time we've come a very long way. 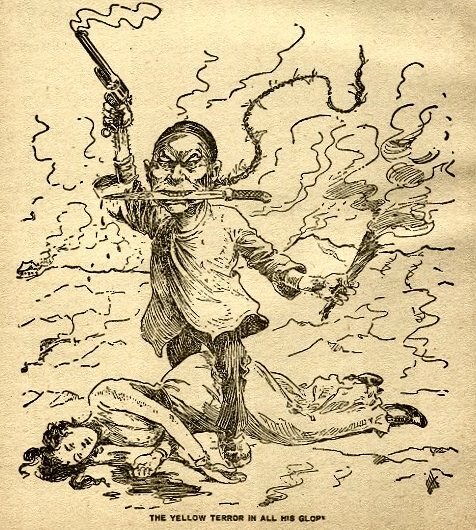 does anyone know who have a source 'bout yellow peril theory? ?